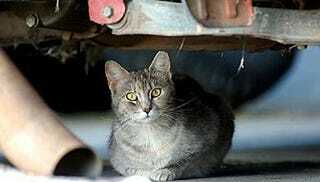 Chrysler has teamed up with an animal rights group to save 100 feral cats at the Sterling Heights, Michigan Chrysler assembly plant because they can't seem to be bothered to save their cars, workers or company. WTF is Chrysler doing? The Sterling Heights plant used to produce the Chrysler Sebring and Dodge Avenger but was slotted for closing last year because, well, it used to produce the Chrysler Sebring and Dodge Avenger. It seems a colony of approximately 100 feral cats have existed in the plant for two decades and, as the plant closed, the management was talking about "getting rid of the cats." Great, more proactive Chrysler decision making. Why make anything better when you can just axe things? The Viper? Gone. Durango? Dead. Sebring? On its way out. PT Cruiser? You'll be able to buy it forever, apparently, but it'll be the same car. Jeep? Ready for adoption. Thankfully, authorities were alerted and a group is now taking care of the colony; feeding and neutering them to control the population. Sadly, this may actually be better treatment then any of Chrysler's workers will be getting for working at the plant for 20 years. Maybe we're too cynical, but while we think it's a good thing these cats won't suffer, we can't help but wonder if this isn't some larger commentary on a company unable to consider the long-term ramifications of their own actions finally doing something helpful only after being called out on their poor decision-making. Or maybe this is just the most Chrysler is capable of saving right now.